Millfield Prep School is seeking a groom to join our growing and dynamic team. Millfield Prep is a co-educational independent boarding school located on the outskirts of the bustling town of Glastonbury. Along with Millfield Pre-Prep, the schools cater for over 450 students from the ages of 2 to 13. Millfield Prep Equestrian Centre has been an established part of the school since 2003 and currently houses 30 horses and boasts 120 acres of land. The Equestrian Centre has fantastic facilities including a hacking trail, a canter track, two all-weather arenas and hosts an annual BE Horse Trials event. 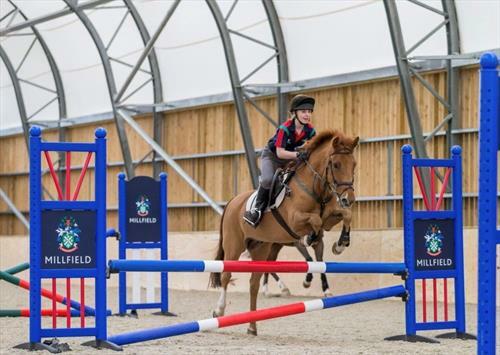 Millfield Prep Equestrian Centre is a crucial part of Millfield Equestrian Sport, closely aligned to the larger centre at Millfield Senior School. This is a full-time role working an average of 48 hours per week. Benefits with this role include - further training with FBHS and BHSIs, payment of ongoing exam/assessment fees, a competitive salary, vehicle training and more, plus the possibility of accommodation awaits the right candidate. Applicants should enjoy working with young children and as part of a small team. Equestrian Centre for Independent boarding school situated in Somerset and caters to children ages 2 - 18. Facilities include stabling for up to 100 horses over 2 sites, combining accommodation in American style barns and traditional stables, indoor arena 44m x 64m, outdoor arena 50m x 70m, 2 sets of BS standard show jumps and portable X-C jumps, cross-country schooling fences, off road canter track and access to gallops, all-weather horse walker and round pen and resident yard staff. Consists of 120 acres in which there is a hacking trail, a canter track and two all-weather arenas and a BE cross country course by Adrian Ditcham, designer of the 2012 Olympics cross country course.